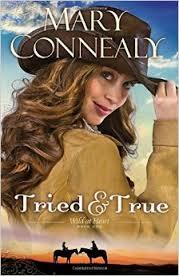 I had the opportunity to get a copy of Tried and True (Wild at Heart) by Mary Connealy in exchange for a review. Now this is not an onerous task by any means. Mary’s style of writing her westerns has always been flavored with a unique voice that adds a bit of humor to even the most challenging situations her characters encounter. Tried and True was no exception to this as she starts a new series, Wild at Heart that I suspect will follow the adventures of the Wilde sisters who, in disguise, fought in the Civil war after their brother was killed. Their father is a bit wrapped up in his grief and they’ve traveled west to homestead using their time served to help pay for the time needed to claim a homestead. That plan however is a bit unnerved by the fact that Kylie Wilde, the youngest sister, really likes being a woman. While wearing pants has its advantages at times, she likes her hair long and wearing skirts and dreams of a more civilized life in the East. She encounters land agent Aaron Masterson who quickly discovers the ruse the girls have plotted to gain their land. Can he let them keep their secret as he falls in love with Kylie? He just wants to finish his job and move far from civilization as possible. As both struggle to reconcile their conflicting dreams with their growing attraction, outside forces threaten to tear them apart. Kylie has a choice to make to follow her heart and desire for this man over her desire for tea parties and pretty dresses. Can she give that up and live in the untamed West? I love Mary’s writing and her characters are lively and I look forward to reading the rest of this series. This was a book that was hard to put down and I smile every time I think about it, because it was just that enjoyable. Kudos again to Bethany House for their amazing cover design. ← Are My Words A Clanging Cowbell? Love your book reviews, Susan! They are delightful and so honest. You have a gift. Sounds like Mary Connealy’s Tried & True is a winner.